It is often recommended that for the safe home tidying tasks, using the appropriate cleaning solutions Perth is highly-recommended. The type of products that will not cause harm to you, your loved ones as well as to the environment. Casually, we just go to the nearest store and grab any products that will work for us. And that’s it! We don’t really consider the benefits it can make and even the hazard it can bring. Sometimes, there are dangers on using store-bought cleaning solutions Perth because they contain toxic chemicals. Which can lead and be linked to cancers, asthma, and many more hormone disorders and neurotoxicity. If you are looking for the best products that you can use, then, consider doing your research. Choose the kind of products that can help you with your tasks and at the same time, will not put your health at risks. The same idea when you choose the right tidying services you need. 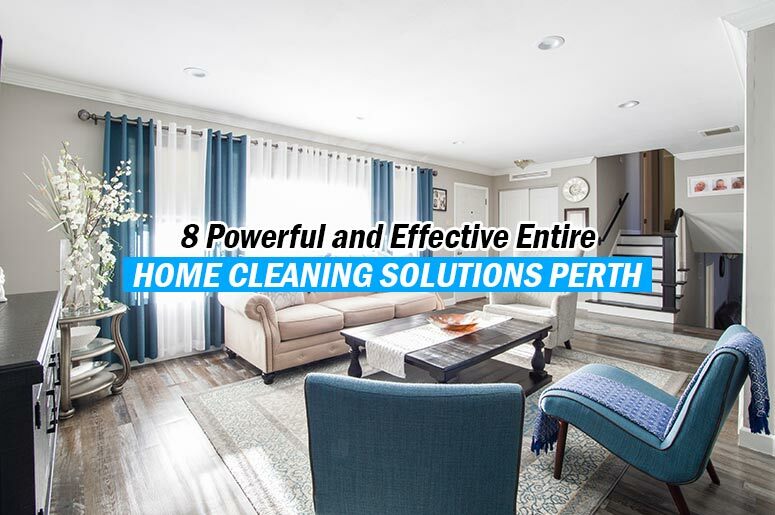 Below are the 7 powerful and effective entire home cleaning solutions Perth for you. You don’t really need to go that far with your search! Read further and find out what are we are talking about. To make this solution, you’ll be needing ¼ cup of white vinegar, 8 drops of orange essential oil, ½ teaspoon natural liquid dish soap and 2 cups of water. Put all the ingredients together in a spray bottle. Shake or stir it thoroughly. You can now use it to make your window and glass become shiny and sparkling. This is one of the cleaning solutions Perth that will not trigger your allergies or asthma. Since the ingredients are not made of chemicals and all naturals and don’t cause negative reactions to your health. It will just leave a good smell on your entire home due to the orange oil. You can use this when you try other tidying window hacks. To make this, you will be needing 8 drops of eucalyptus and essential oils, a cup of water, ¼ cup of white vinegar, and 8 drops of lemon oil. Get a piece of cloth that you can use for wiping. Mix all the above ingredients thoroughly and pour it into the container. Once done, you can spray it to the cloth and start wiping your shelves, tops and even cabinets and drawers. You can now say goodbye to those grout removing products that are full of chemicals! With the use of one of these cleaning solutions Perth, scrubbing is no longer necessary. First, get a ½ cup of baking soda, a castile liquid soap and 5-10 drops of lavender tea tree and rosemary essential oil. Place the baking soda in a mixing bowl. Then, pour the castile liquid soap on it. Continuously stir it until it becomes well-mixed. Finally, add the remaining ingredients. And voila! You now have a product that’s non-toxic and effective for your tile and grout problems. Just simply dip a sponge into the cleaner. Then, apply to the tile and rinse for great results. For this all-purpose cleaner, you will be needing 1 tsp borax, washing soda and liquid castle soap. Mix these three ingredients with a ½ cup of white vinegar in a large bowl. Then add 2 cups of hot water and stir it. After it cools down, add 25-30 drops of essential oils. Pour all the mixture into the spray bottle. Feel free to use it whenever you need to tidy your bathroom. There are different cleaning solutions Perth for your shower and tub. With this compound, it can erase tough stains and soap scums. As well as the clogs that are troubling your bathtubs and showers. Get a 1 cup of white vinegar and the same measurement of natural dishwashing liquid. Heat the vinegar on a microwave. Once done, place it in a spray bottle. Gently add the dishwashing liquid then shake it very well. Open your bathroom door and windows before you put it on your tub and shower. Because its effect is potent due to the vinegar smell. For your carpet, get a baking soda, 1 tbsp natural dishwashing soap and white vinegar and 2 cups of warm water. Just sprinkle the baking soda to the stained part of your carpet. Then, leave it for 10 minutes. As soon as baking soda absorbs the stain, vacuum it. To totally remove the stain and blot, combine the liquid soap, water and vinegar in a bowl. Use a sponge, damp it on the mixed solvent and put on the blot. Dry it using the dry cloth. Sometimes you just really need to be practical to get the best result. And if you’re on a tight budget, doing the above tips can help you. You may not yet aware of it but most of the cleaning solutions Perth you can find on the market are harmful to your body and environment. So instead of buying those kinds of cleaning solutions Perth you found, why not make one on your own? Check our page and see what more can we offer you! Visit our blog section for more services and useful hacks and tips. Get in touch with us today. This entry was posted in Home Cleaning, House Cleaning and tagged cleaning solutions, cleaning solutions perth.